Whether you are looking for a family beach holiday or a romantic weekend retreat, we have Lorne accommodation to suit everyone and available at great rates. Lorne, on the Victorian Coast at Louttit Bay, is a picturesque sea side town offering visitors the chance to relax and enjoy the beautiful ocean vistas. Lorne’s biggest attraction is that it is the mid point of the spectacular Great Ocean Road, which runs from Torquay to Allansford. Our Lorne accommodation is a perfect base for exploring the Great Ocean Road, which is one of Australia’s most scenic drives and passes the famous Twelve Apostles rock formation just east of Port Campbell. If fine food and wine is your thing then our Lorne accommodation is the perfect to base to enjoy all the culinary delights of the area, from the cafes and restaurants along the main road, which offer great ocean views and alfresco dining when the weather permits, to Darriwill Farm specialising in gourmet food and wine. The area is also famous for its fine ice cream, seafood and locally grown berries. 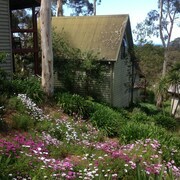 Our Lorne accommodation also makes a great base for visiting the Otway Estate Winery. 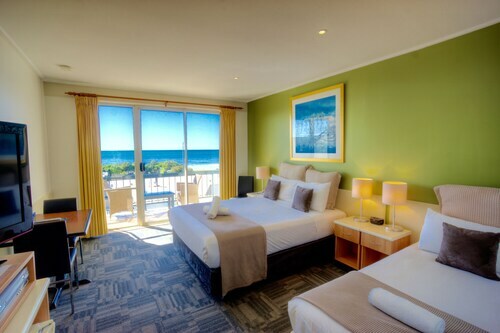 Our Lorne hotels are perfect for a family holiday as Lorne’s main beach is protected from ocean swells by Point Grey and thus has gentle waves perfect for children. The beach is patrolled by volunteer and paid life guards from mid November until Easter Monday. Children will also enjoy exploring the beach’s rock pools which teem with life, especially at twilight when the fascinating sea creatures come out to feed. While staying in one of our Lorne hotels, explore the Great Otway National Park, with ancient rainforests, coastal heaths and rugged coastline. Take a walk through the rainforest canopy on the Otway Fly Treetop Walk which stands 20-37m above the ground. The area is famous for its excellent surfing conditions and is known as Victoria’s Surf Coast. Our Lorne accommodation makes a great base for visiting Bell’s Beach, which is Australia’s most famous surf beach because of its annual, world-renowned, Easter Surfing Classic. 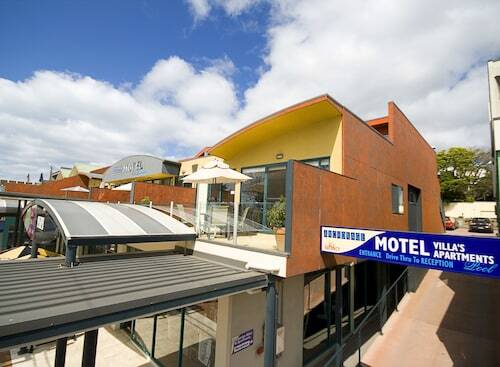 Or soak in the Bells Beach atmosphere by staying in our nearby Torquay hotels. Other popular regions to stay on the Victorian Coast include Great Ocean Road, Anglesea and Aireys Inlet, Apollo Bay, Wye River and the Mornington Peninsula. 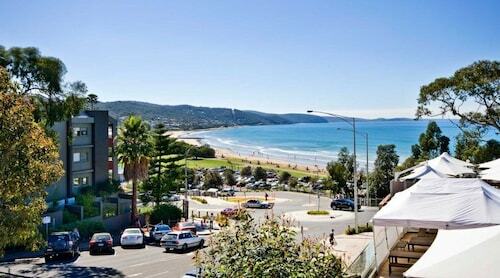 Having a hard time deciding which of our Lorne hotels to stay at? Why not check out our picks of the best deals in the region? Need insider tips on must-see attractions in Lorne? Check out our Lorne travel guide! How Much is a Hotel Room in Lorne? Hotels in Lorne start at AU$115 per night. Prices and availability subject to change. Additional terms may apply.